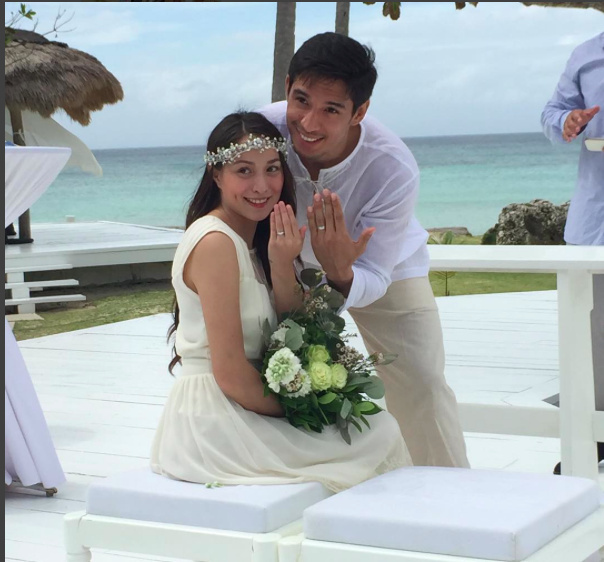 MANILA, Philippines- Kapamilya actress Cristine Reyes and mixed martial arts (MMA) fighter Ali Khatibi have tied the knot in an intimate Christian wedding ceremony on Wednesday, January 27 at Balesin Island. In an interview with Tonight with Boy Abunda on January 4, Reyes revealed that their wedding will be private and will be attended by the couple, the pastor, the wife of the pastor and some witnesses. Reyes also disclosed that they intend to have another wedding in Manila to celebrate with their friends. “Magkakaro’n pa rin kami ng another wedding, later on, when everything is settled na. Kasi right now ang daming nasa plate namin ni Ali, e. May work, Amarah, new house, ang dami,” Reyes explained. The 26-year-old actress recounted in her guesting at the December 8-episode of Kris TV that she and Khatibi chose to marry on January 27 since it’s the same date that they discovered their feelings for each other in 2013. Meanwhile, Balesin was their second option for the venue since they initially planned a backyard wedding at their house in Parañaque, which is still under construction. The couple initially met in 2005 after being introduced by Hale’s vocalist Champ. Although their first meeting wasn’t memorable according to Reyes, the two crossed paths again in 2012. In September 2015, Reyes and Khatibi announced their engagement. The two welcomed their daughter Amarah on February 8, 2015. Check out some of their wedding photos.